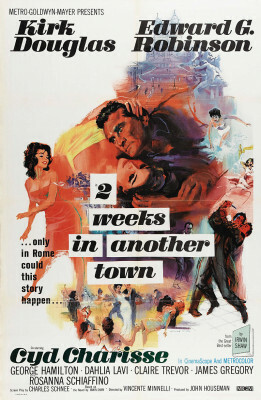 After many months in a sanitarium following a horrific car crash in which he nearly died, alcoholic has-been movie star Jack Andrus (Kirk Douglas) receives an encouraging letter from director Maurice Kruger (Edward G. Robinson), urging him to fly to Rome, where he's shooting a film at Cinecittà Studios. The doctors at the sanitarium endorse Andrus's release. Movies about moviemaking almost always perversely get all the details wrong, and Two Weeks is no exception, though the behind-the-scenes footage at Cinecittà is moderately interesting. 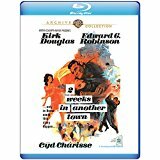 Film in Panavision (though advertised as CinemaScope), Two Weeks in Another Town looks okay but not great on Blu-ray. It looks like an older transfer, lacking the snap of the many of the ‘scope titles licensed from Fox in recent years. Likewise the mono audio, supported by optional English subtitles. The lone Extra Feature is a trailer that doesn't sell the film well.